And what the hell is this? Kale. Russian. Russian Kale. When I was living back in Italy, this thing here, with curly leaves and purple stems, sweet taste and non-cabbagy smell, well... I had never seen that thing there. But let's be clear, if by chance any of you knows that it does exist over there, and perhaps has also an aunt who grows it every year in the garden in the back of the house, well, what are you waiting for? Step up and save me from embarrassment. I actually discovered it only after a decade since I moved here in the U.S., but then, I've always known to be a leader. It seems that Russian kale was introduced in America in the nineteenth century by Russian traders, from which it takes its name. If the same traders had forgotten one plant along the Adriatic coast as well, we do not know. As for me, when few days ago I decided to use it for the first time, it was love at first sight. Russian Kale, now and forever. It is my new obsession, along with pomelo, sweet lemons and iPad2 Medjool dates. I promise that from now on I will never let it go. Toast the cashews in the oven for about ten minutes. Peel the garlic cloves and cut them in half. Wash the kale leaves, remove the hard ends and cut it in pieces. Gather all ingredients in the mortar mixer and blend like crazy. Thanks! 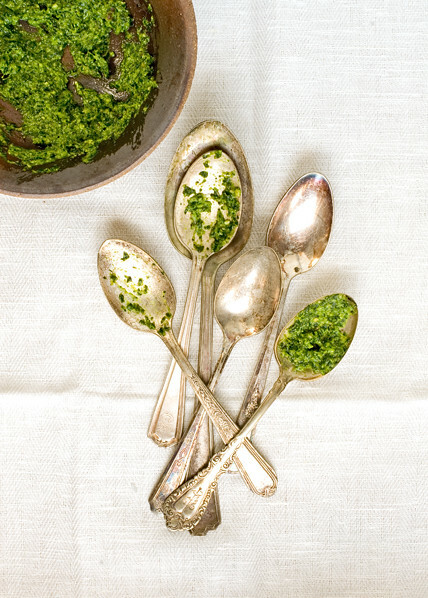 vintage silverware can easily become an addicition! love the recipe and the vintage spoons even more!! @anonymous: that is really funny! It doesn't seem to be hard to grow though, I wonder why it's not very common, being so good! Awesome! I am growing some at the moment in my garden. It is pretty easy to grow even in coldish climates, but during the warmer months it really gets attacked by cabbage butterflies. Do you use this pesto just like any normal basil pesto?